I love a good chicken dish — especially one packed with flavor and oozing with cheese. 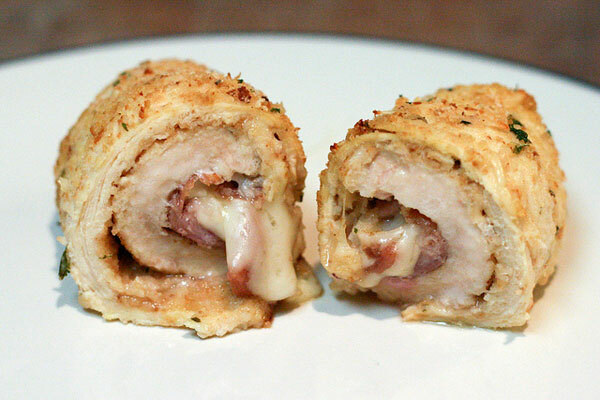 We first prepared chicken rollatini when my mother visited two weeks ago. Why not kick off our Italian culinary tour with a delizioso dish of our own, right? This recipe calls for prosciutto and provolone, but you could also use sopressata and cacciocavallo cheese or pepperoni and mozzarella cheese. Be creative! Serve over a bed of arugula or alongside roasted veggies. Wash and dry chicken cutlets with paper towels. Combine breadcrumbs and Parmesan cheese in one bowl and olive oil, lemon juice, and pepper in another bowl. Preheat oven to 450°F. Lightly spray a baking dish with non-stick spray. Dip chicken into lemon-oil mixture, then into breadcrumbs to coat well. Place each cutlet on a work surface and lay prosciutto, Provolone cheese, and a few chunks of red onion onto cutlet. Roll and place seam side down in a baking dish (no toothpicks needed). Repeat with remaining chicken. Top with remaining crumbs and spray lightly with oil. Bake 25 to 30 minutes. Serve immediately. wow this looks delicious and simple! I can’t wait to try it.